How do I add or remove titles in my OverDrive reading history? With your history, you can see which titles you've already read or where you left off in a series. To view your history, go to your account and select History. Each time a title is borrowed, it is added to your history. At launch, you will see an empty history until you borrow a title, or manually add it. Titles can be manually added by clicking on the context menu and selecting Add to History or from the title details page by clicking Add to History. 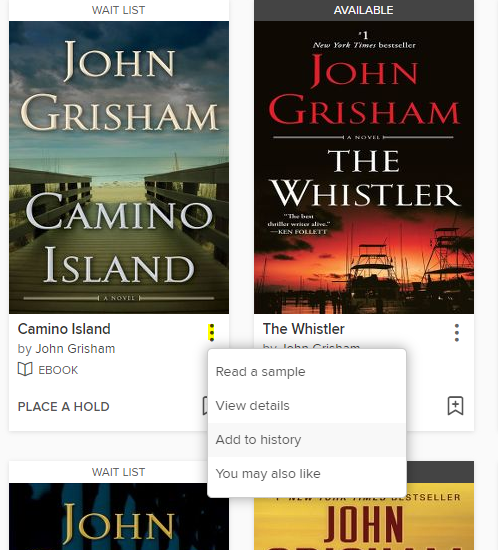 You can add titles you’ve read before the start of the history, or titles read from other sources (print, purchased, etc.). If you have been tracking your read titles via ratings, the history page includes an option to import your rated titles list, by selecting “Add rated titles”. If a rated title is already on the history, it will not be added again. You can remove individual titles from the History page through the context menu or on the title details page. 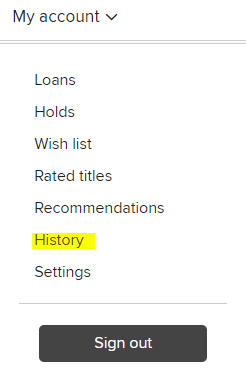 You can choose to hide your history from the Settings page. If you opt to display your history again later, you will only see titles added from that point forward. For more information, visit the OverDrive help page.